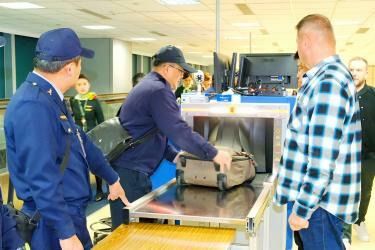 Aviation police yesterday pass a traveler’s suitcase through one of the 16 X-ray machines installed at Taiwan Taoyuan International Airport’s two terminals. Two Chinese pork jerky products seized at customs have tested positive for African swine fever, the Council of Agriculture said yesterday. Tests found the two products collected from the quarantine amnesty bins at Taipei International Airport (Songshan airport) on Jan. 23 and 24 — one from Jiangsu Province and the other without a label indicating origin — had strains of the virus identical to those found in China, the council said. The results brought the number of confiscated pork products testing positive for the disease to 20, council data showed. Two more Chinese visitors on Saturday were denied entry into the country after failing to pay a NT$200,000 (US$6,505) fine for the illegal import of pork products, bringing the total of barred visitors since the regulation took effect on Jan. 25 to six, all Chinese, council data showed. The council reiterated that it hoped Beijing authorities would provide more information about the disease, after the Rural Development Foundation on Saturday received a response from China’s Association for Agricultural Exchange Across the Taiwan Strait. The foundation has since 2004 served as an information channel with the association, which is governed by Chinese Ministry of Agriculture and Rural Affairs. It first wrote to the Chinese association on Dec. 20 last year to request information about the African swine fever outbreak in China, but the latter replied on Jan. 15 that the outbreaks were “sporadic” and called on Taiwanese to stop spreading false information, according to copies of the letters shown on the foundation’s Web site. It wrote to the association again on Jan. 25 and received a reply on Saturday. The disease has spread to 25 Chinese provinces, municipalities and regions, with 950,000 pigs having been culled, but blocks over infection areas in 23 provinces have been lifted, showing China’s quarantine measures were effective and that the outbreaks have abated, the association said. While it was a sign of progress that the Chinese side finally replied, the information was of no avail as the same data is available from the World Organization for Animal Health (OIE), the council said on Saturday, adding that it expected Chinese authorities to provide “complete” information about the outbreaks. The council last year said it wanted to send a delegation of academics and technical experts to China to collect information on the outbreaks, but has yet to receive a response from the other side, council Chief Secretary Chang Chih-sheng (張致盛) said yesterday. The Democratic Progressive Party (DPP) yesterday said it would file lawsuits against a group of politicians over allegations that the party condoned a shooting last month. Aimed at Chinese Nationalist Party (KMT) lawmakers, the lawsuits were the first court challenges to be filed following the incident, in which Sean Lien (連勝文), a KMT Central Committee member and son of former KMT chairman Lien Chan (連戰), was shot on Nov. 26.